Always bet on RED, Taylor Nation. Here at the Swift Agency, just a guy who… ok, I know what you’re thinking. You’re right. I have way too many nicknames for the Sparkly Dr- for Taylor Swift, and I just decide to put a completely new one on the freakin’ title of all places. Once in a while you have to take some risks. I’m living on the edge. 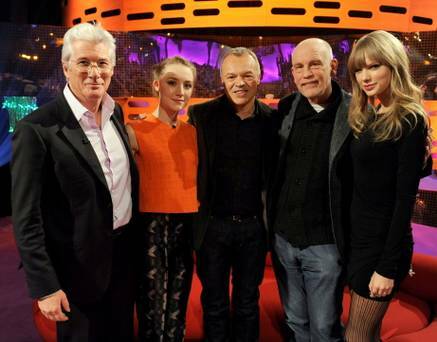 The Blonde With The Sparkly Guitar performed at The Graham Norton Show in an episode along with Richard Gere, Saoirse Ronan and John Malkovich which aired tonight, February 22. She also sat down for talk with the other guests. Thank you to TaylorSwiftArchives for posting! March 2: Taylor Swift’s recorded performance for Let’s Dance For Comic Relief airs on the BBC One. Next Next post: The Sparkly Dressed will appear on InStyle UK. RED nominated for a Juno Award!